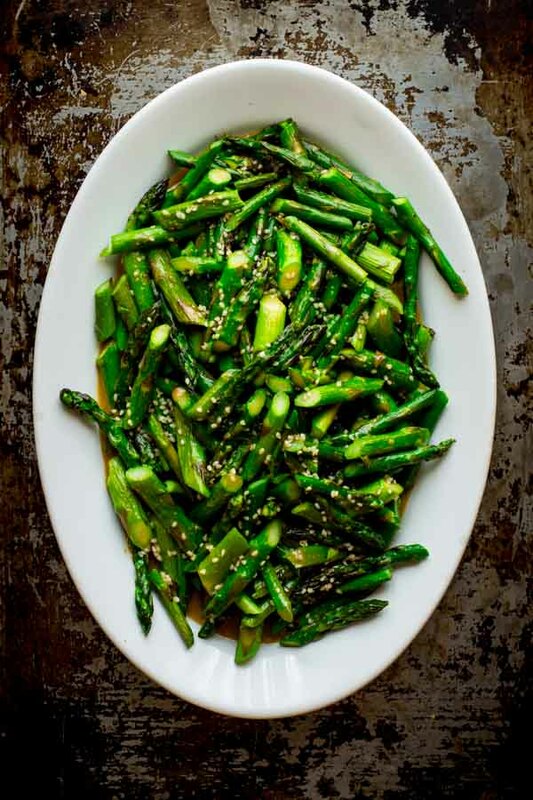 This sesame roasted asparagus salad is a cinch to whip together. 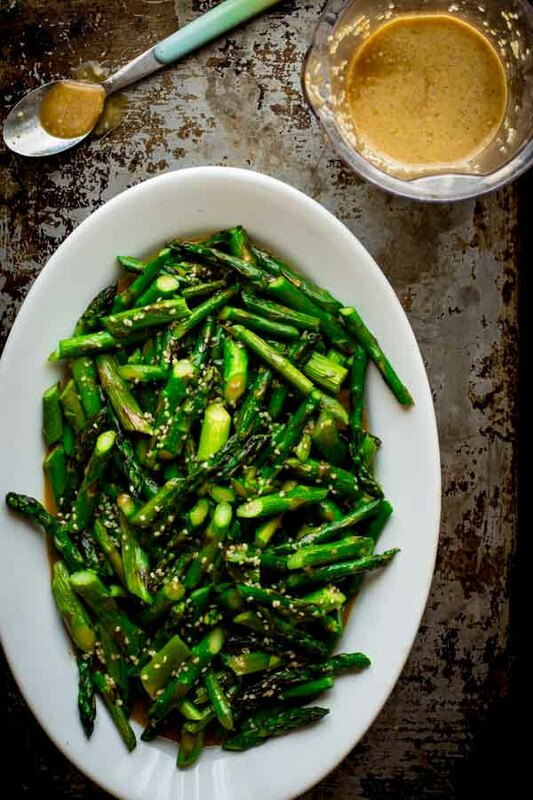 Roasting asparagus is super easy, and it makes a perfect base for flavorful sesame salad dressing. You can either serve it warm or let it come to room temperature. Local fresh asparagus is finally here! The trees have leafed out in their entirety (most species at least) and I feel like a huge wave of relief has washed over me. I am a summer time gal, and the warm months are here to stay. What is up with that Mother Nature? Are you just f-ing with us to remind us who’s in charge? Anywhoo, the asparagus has endured, and oh how I rejoice! With asparagus in the house I knew that I would have to add it to the collection of salad month recipes for you guys. No lettuce required. Just asparagus and dressing. I was going to add some scallions for garnish, but I decided to keep it even simpler than that. 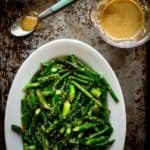 Roasting is really such a yummy way to prepare asparagus, a flavorful dressing is really all that’s needed to call it done. I went back to the uber yummmmmy and easy sesame salad dressing for this recipe. I’m so glad to have the rest of the batch to add to more salads this week. The greens are rolling in from local farms and in our CSA so I am just trying to keep up! Plus we got a cucumber that would be happily drizzled in it. If all goes well I really am going to plant my vegetable garden today. Snow or no. Have you seen snow and daffodils together before? Did you get your seeds and seedlings in yet? Are you getting local greens and asparagus where you are? 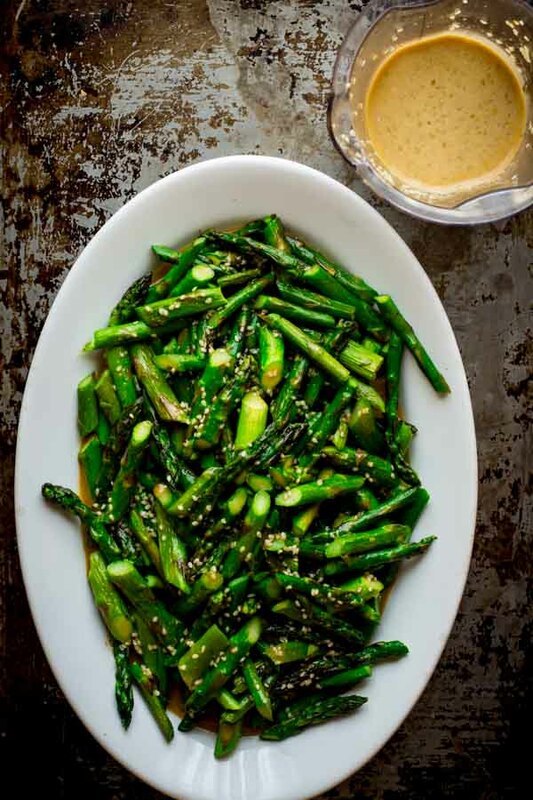 Simple roasted asparagus salad recipe with sesame dressing added right before serving. 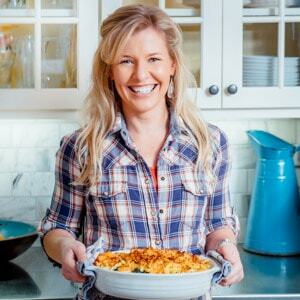 It can be served hot or let it cool to room temperature for relaxed gatherings. Preheat oven to 400 degrees F. Chop asparagus into 1 to 2 inch lengths, on the bias if desired. Toss with oil and salt in a large bowl. Spread out on a large rimmed baking sheet. Roast, stirring once until browned in spots and crisp tender, 8 to 12 minutes. Transfer to a large platter. Right before serving, pour dressing over the asparagus. Lol, thanks so much Jessica. Fixed it! Have a great day. Just cannot get enough asparagus in the spring time. 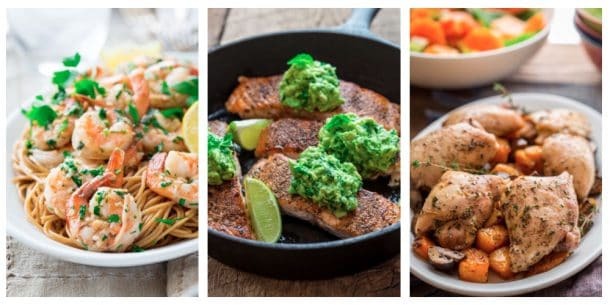 Your recipe looks marvelous, so much so that it is my pick for Recipe of the Day on my foodie FB page and other sharing sites. Thanks for a wonderful new salad, and dressing! I devour it at this time of year too. And the fiddleheads! Gotta love the spring. Thank you for helping to promote this post Kathryn. I appreciate it much! I love asparagus and wish I could get my hands on it more often. This recipe looks absolutely delicious. Thanks for sharing! I love asparagus! This is my new favourite salad recipe! Love asparagus. I had some today, but we instead of ovening them, we used a grill pan to fry them. Still crunchy, my favourite green. Good idea Leo! Have a good day. Here you go: https://www.healthyseasonalrecipes.com/sesame-dressing/ enjoy! !